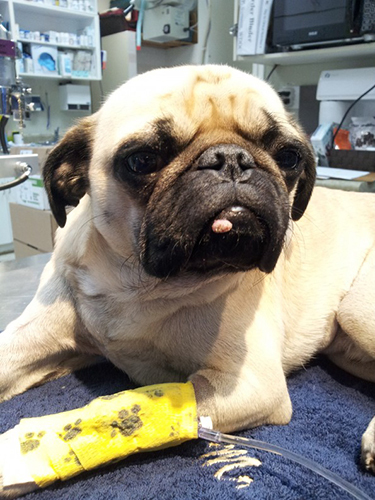 November’s Patient of the Month is an delightful little pug by the named of Frank Muir. Frank came to us last month for vomiting and lethargy. Upon arrival, lab work and digital radiographs were done in-house. As nothing alarming appeared on either, Frank went home with some medications for his parents to monitor closely. If no improvement was seen, it was recommended that Frank return for a recheck exam and an abdominal ultrasound. Frank did quite well at home for a few days, but then began to vomit again. He came back for a recheck exam and was admitted to our hospital to be kept on IV fluids while futher diagnostics could be carried out. Dr. Dhillon then came in to perform an abdominal ultrasound on Frank and determined that there was an abnormality in his small intestine. Frank would need an exploratory surgery to determine the cause of his illness. The next day, brave Frank was scheduled for surgery with Dr. Dhillon. In surgery it was determined that the abnormality seen with ultrasound was a foreign body. It looked as though silly Frank had swallowed a piece of a ball or toy and it had gotten stuck on it’s way out of his system. The foreign body was removed and Frank is on the road to recovery with the help of his loving parents Matt and Megan!